Power consumption is a very important characteristic of single-board computers (Raspberry Pi, Latte Panda) since they are oftenly powered off batteries in mobile applications. 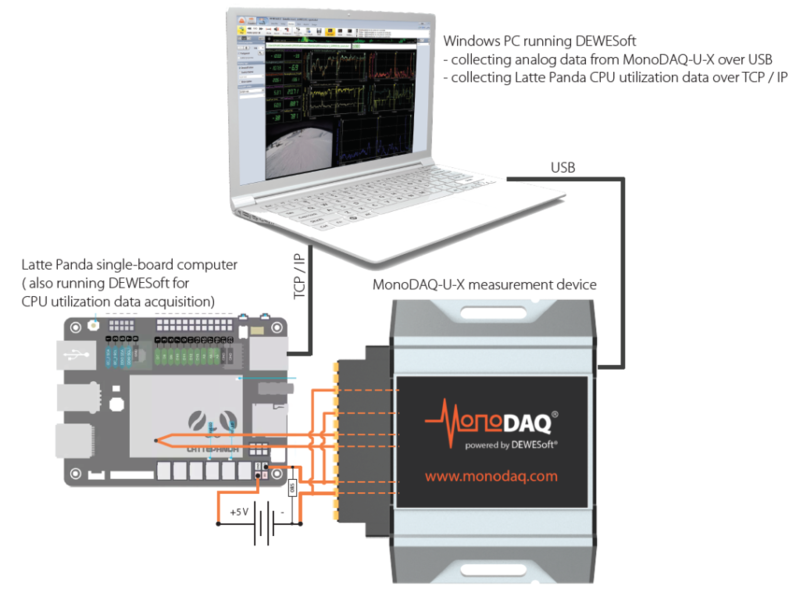 MonoDAQ-U-X data acquisition device allows precise measurement of voltage and current while the data is displayed in user-friendly DEWESoft software. Additionaly also the temperature can be monitored to analyze the relation between the CPU load, power consumption and heatsink temperature. We wired the Latte Panda battery connection through the MonoDAQ-U-X current input pins to directly measure the current. Additional 0R5 shunt resistor was placed in parallel to the internal shunt to increase the measurement range. The actual peak current input range on the MonoDAQ-U-X is +-2 A, but the internal shunt is temperature rated at 500 mA, therefore higher average current is not advisable. With additional parallel shunt of 0R5 we increase the rated range to 1000 mA and the peak range to +-4 A. Battery voltage was measured in parallel on a +-10 V differential measurement range which allowed us to measure the power consumption. Thermocouple T-type was used to monitor the heat-sink temperature. 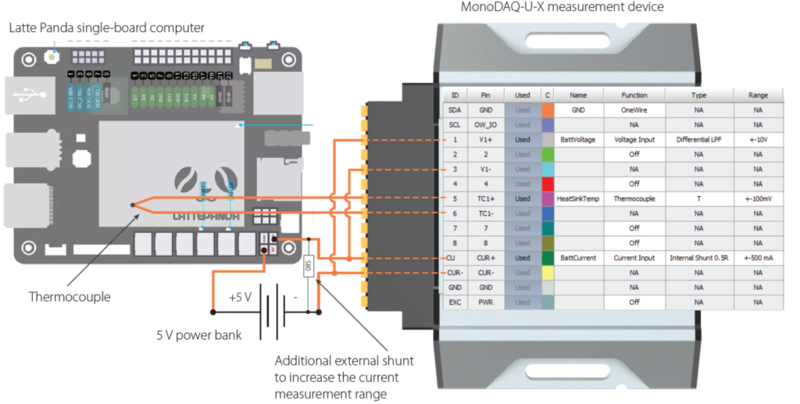 Figure below shows the channel setup of the MonoDAQ-U-X device in DEWESoft software. To compute the power, DEWESoft’s Math section was used for simple power formula that was calculated online during the measurement. Initially we only used voltage and current input channels to be able to record the startup sequence with the sample rate of 10 kS/s. The result is shown below. We can see that the current goes up to 1000 mA right at the battery connection and then gradually decreases until after about 18 seconds Latte Panda goes to sleep mode and requires only 64 mA until we press the power on button. Then the Windows boot sequence starts which reaches maximum currents of more than 1000 mA until it stabilizes at about 400 mA after Windows is completely booted up and basically idling. Power consumption is about 2000 mW in that state. In the second part of the test we wanted to see what happens when the CPU is fully loaded. We were interested in the temperature of the heatsink as the base for the cooling requirements of the chassis for the mobile device that would embed the Latte Panda. Additionally we waned to monitor the CPU utilization in the same data file. 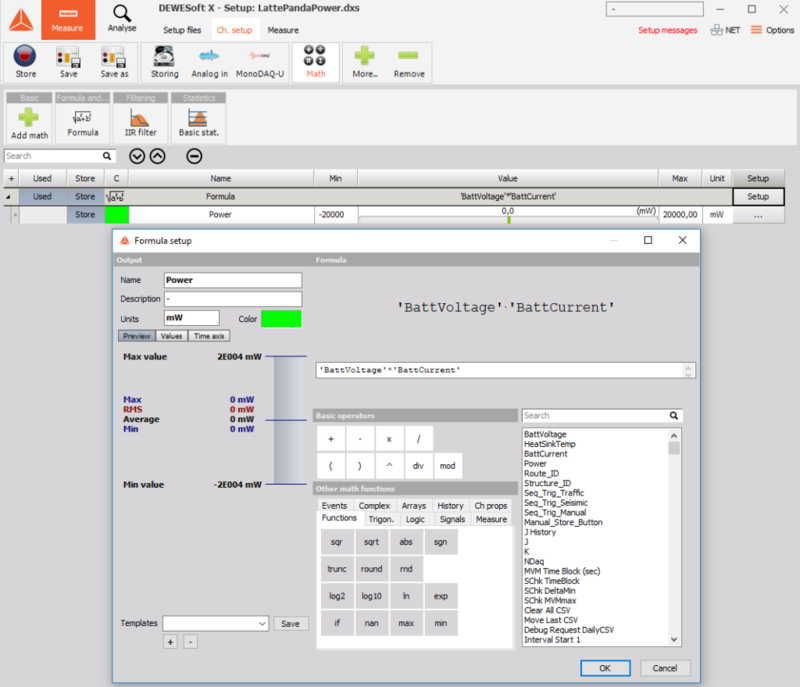 Since our MonoDAQ-U-X is connected to a separate PC running DEWESoft, we had to transfer the data about CPU utilization from the Latte Panda to local DEWESoft. This was done with a DEWESoft NET (DEWESoft NET is an optional DEWESoft plugin and is not included in standard DEWESoft that ships with MonoDAQ-U-X device). Figure below shows the DEWESoft NET configuration. The data on CPU utilization (and other CPU parameters) is collected using DEWESoft’s System monitor, shown in the figure below. Figure below shows the results. The jumps in CPU utilization values are well correlated with the jumps in current drain. We were performing random tasks on the Latte Panda for almost two minutes where you can see the CPU utilization being mostly under 40 %. The temperature, starting at 60 deg C at idle state, increased each time the power consumption increased and it did not really cool down while the power was at lower level. This is because we were only using the Latte Panda in with the standard heatsinks that are basically flat plates and not real heatsinks with ribs, so the heat dissipation is limited. 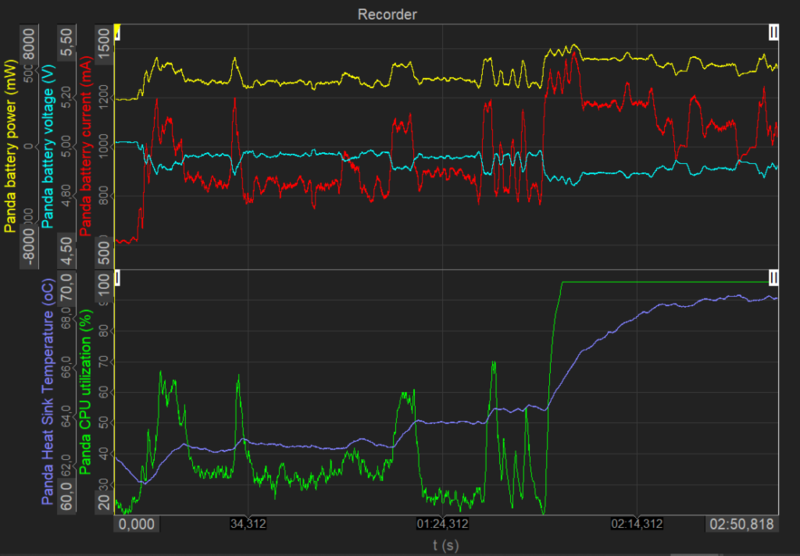 After we ramped up the CPU utilization to almost 100%, the power consumption increased to more than 5 W, also reacing 6 W. The temperature stabilized at about 70 degC in that state. Note that the room temperature was about 25 degC while in the time of the test.